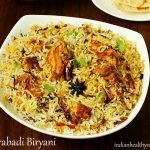 Hyderabadi biryani recipe. Making a good hyderabadi biryani is very simple and this recipe is perfect for a home preparation. This is the easiest biryani since it needs no sauteing of spices or meat. Just marinate the meat with the spices & other ingredients. Layer partially cooked basmati rice over it. Cook on a slow dum process, trapping the steam to retain the aroma. To get an authentic flavor and taste of Biryani, do use all the mentioned ingredients and if desired can substitute ghee for oil. 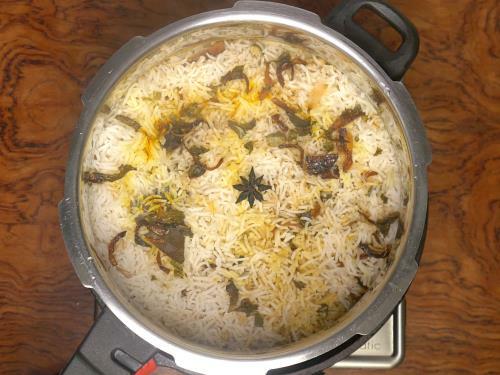 This is one of the best hyderabadi biryani recipe I have made for years and has been a favorite among the readers of this blog. It is very easy and even a beginner can try without any troubles. This is a kacchi hyderabadi biryani, meaning partially cooked rice is layered over the marinated raw meat. To make the best out of this recipe, chicken needs a proper marination which mainly helps to tenderize it, resulting in juicy, flavorful, soft and tender chicken. 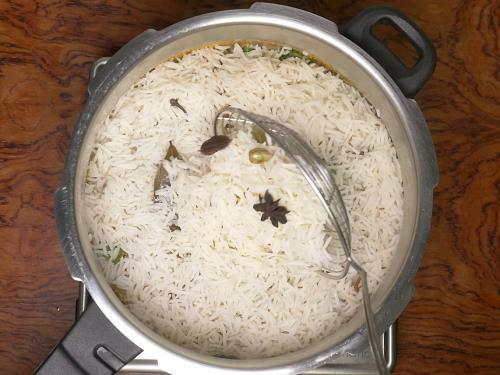 It can be marinated the previous night and refrigerated to make the best flavorful biryani. 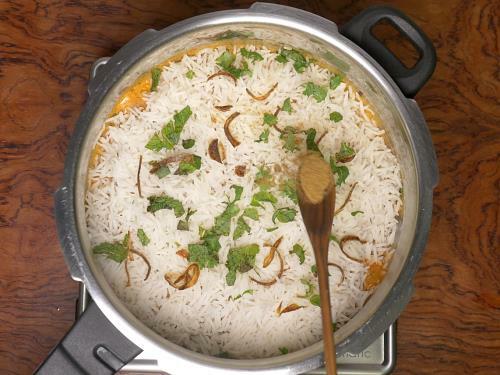 Easy hyderabadi biryani recipe made with basmati rice & chicken marinated in spices. 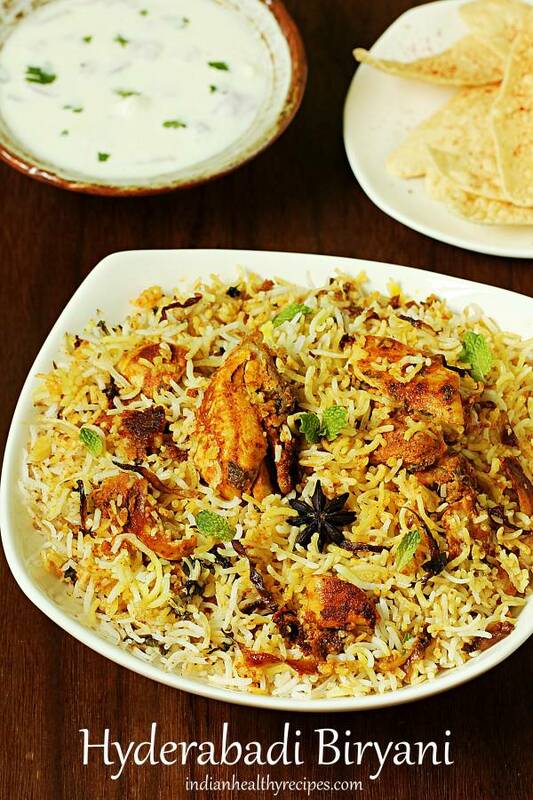 This hyderabadi biryani recipe will give you the best biriyani that’s flavorful & delicious. Heat 4 tbsps oil in a deep pan. Slice onion thinly, separate the layers and fry them stirring often in hot oil until deep golden to brown. Do not burn else they turn bitter. Remove them from oil & set aside. Pour this oil to the marinade later. 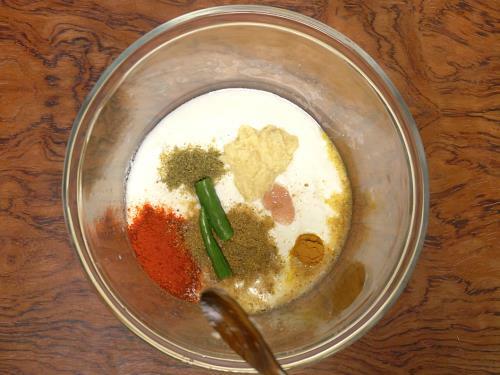 Add yogurt, salt, turmeric, chili powder, biryani or garam masala powder, cardamom powder, green chilli, ginger garlic paste & lemon juice to a mixing bowl. Mix well & taste this. If needed add more salt or spice. Next add in chicken & marinate for 2 hours to overnight for best results. 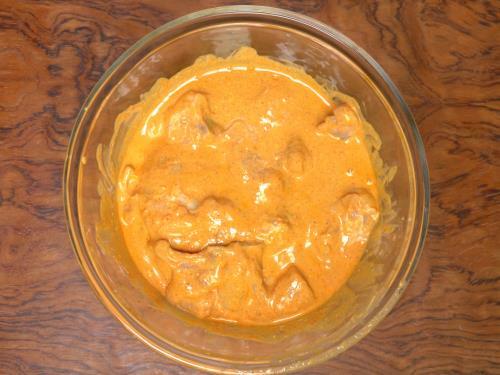 Overnight marination in fridge yields best soft succulent chicken. Wash rice till the water runs clear. Soak for 30 minutes. Drain & set aside. Heat 6 to 7 cups water in a pot. Add 1 tsp oil, whole spices & salt. Taste this. The water has to be slightly salty. 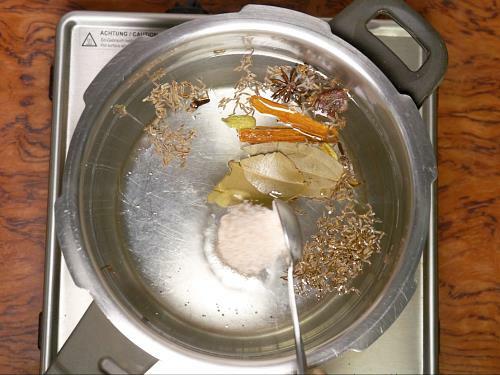 Boil water rapidly for 5 mins to release the aroma of spices. Add rice & cook till it is ¾ or 75% done. The center of the rice must be still slightly uncooked. Do not make the rice mushy. Drain off to a colander. While the rice cooks, transfer marinated chicken to a heavy bottom casserole or non-stick pan. Add oil, ½ of the fried onions, mint & coriander leaves. Mix & spread chicken in a single even layer. Layer the cooked rice evenly, sprinkle fried onions, mint & coriander leaves over the chicken. Sprinkle ¼ tsp masala powder. 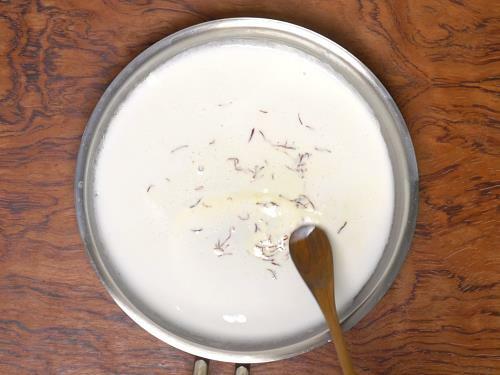 Pour the saffron milk all over & then ghee. 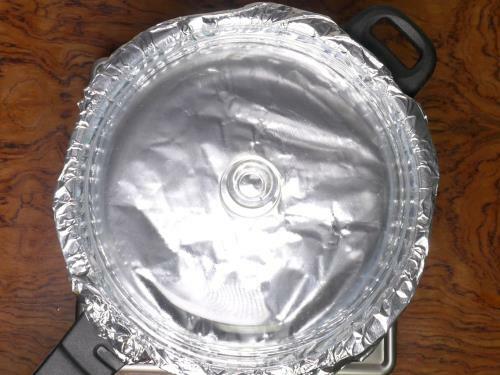 Cover the pot with a foil to trap the steam or dum. Then cover with a tight & heavy lid. Bake for 30 to 40 mins at 200 C in a preheated oven. The timings will slightly vary depending on the depth of the casserole/pot used. Once done, if the chicken is too moist then bake for another 10 mins. Place this over a thick hot griddle or tawa. Set the flame to medium high such that the flame reaches all over the diameter of the casserole. Cook this way for exactly 20 mins. Reduce the flame to lowest. Cook for exactly 15 mins. Off the flame. Rest for 20 to 30 mins. 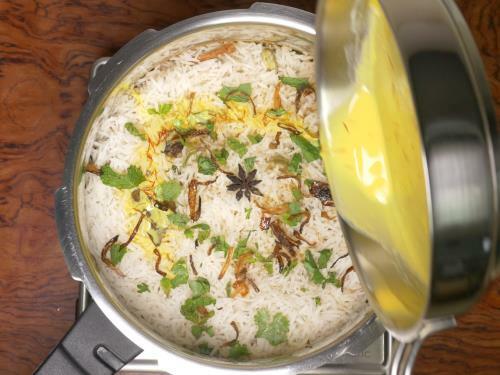 Garnish hyderabadi biryani with fresh chopped coriander leaves & serve with raita. 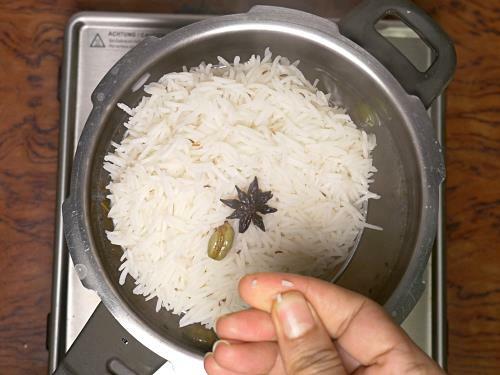 If you do not like to bite in the spices, then tie up all the whole spices for rice in a muslin cloth. Add this to the rice pot. Do not use sour curd or flavored yogurt. To Brown the chicken – The last 5 mins cook the biryani on a medium high flame. This gives browned chicken. To prevent charring you can check the chicken at the bottom before you do this. If you do not like to use a cloth for trapping the steam or dum, you can use dough to seal the lid of the utensil. But cleaning up the mess is difficult. 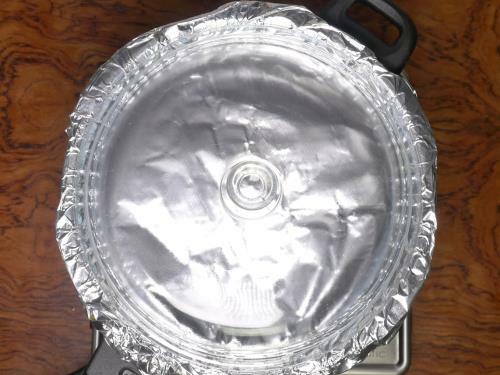 An aluminium foil too works. 1. To a mixing bowl, add yogurt, salt, red chili powder, biryani masala, turmeric, green chili, ginger garlic paste and cardamom powder. Do not use sour curd. 2. Add lemon juice. If your curd is even slightly sour, them just skip lemon juice. 3. Taste the marinade. Add more salt if needed. 5. Allow it to sit for overnight in the fridge or for at least 2 hours. 6. Keeping overnight makes the chicken very soft once the biriyani is cooked. If you are marinating it just for 2 hours, I suggest keeping the pieces to small to medium and not very large. 7. Soak saffron in 3 tbsps hot milk. Do this just before you soak the rice. 8. Wash rice at least thrice. Do note that biryani turns out good only with aged premium quality basmati rice. 9. Soak for 30 to 40 mins. Refer to the rice pack for soaking time. 10. Drain after 30 to 40 mins. Set this aside. 11. Add whole spices to a pot of boiling water along with 1 tsp oil. You can add the whole spices to a muslin cloth and make a knot if you don’t like to get a bite of the spices. Allow the water to simmer for 5 mins. Then bring it to a rapid boil. 13. Cook on a medium high till rice is ¾ th cooked. 14. The rice must be grainy and you must get a bite into it meaning it has to be slightly under cooked. 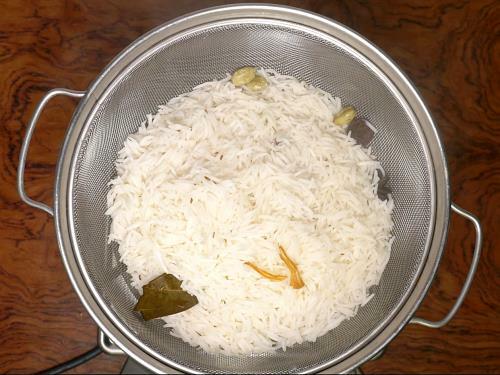 If you are a beginner, please take a look at this detailed post on how to cook basmati rice for biryani. 15. Drain the rice to a colander. 16. While the water for rice boils, add the chicken marinade to a heavy bottom pot. I used my 6½ ltrs heavy bottom pressure cooker pan. Sprinkle fried onions, coriander and mint leaves. Add oil and mix it. 17. 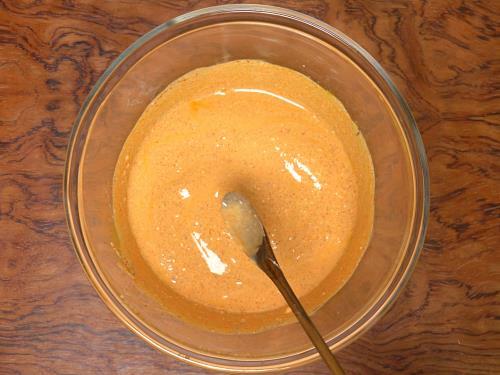 Level the chicken to spread it in a single uniform layer. 18. Layer the rice over the chicken. The rice must be moist and not with dripping water. It should not be dry either. Add fried onions, mint and coriander leaves. Sprinkle biryani masala. 19. Layer the rice again. 20. Sprinkle fried onions, mint and coriander leaves and biryani masala. Pour the saffron milk. 23. Method 2 – Use a foil to seal the rim completely. Or make dough and stick to the rim of the pot. Place a heavy lid. 24. 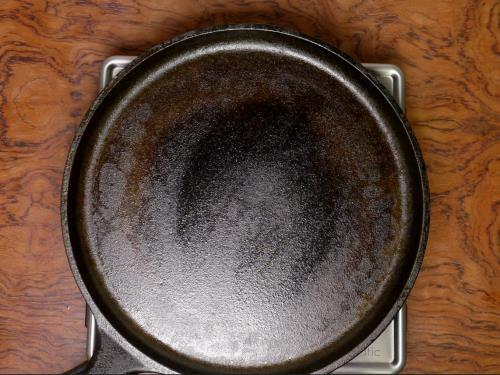 Place a old tawa or griddle on the stove. The flame has to be medium high. Do not use a non stick pan or a dosa tawa. I used my lodge cast iron pan which doesn’t work for making dosa. The flame has to reach across the diameter of the pan. 25. Place the biryani pot on the tawa. Cook on a medium high flame for 15 to 20 mins. Then Lower the flame to very low and cook for another 15 minutes. Switch off the stove and let it rest for sometime. 26. Fluff up the rice gently. Serve hyderabadi biryani in layers with shorba or raita. 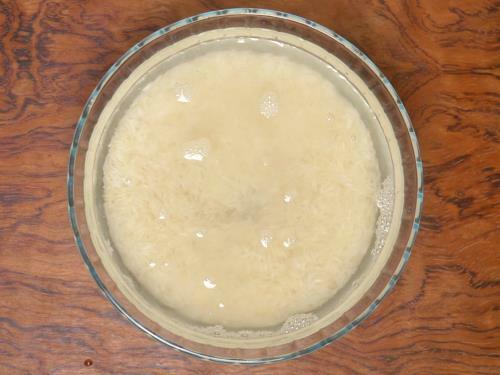 you can also find easy biryani gravy recipes. 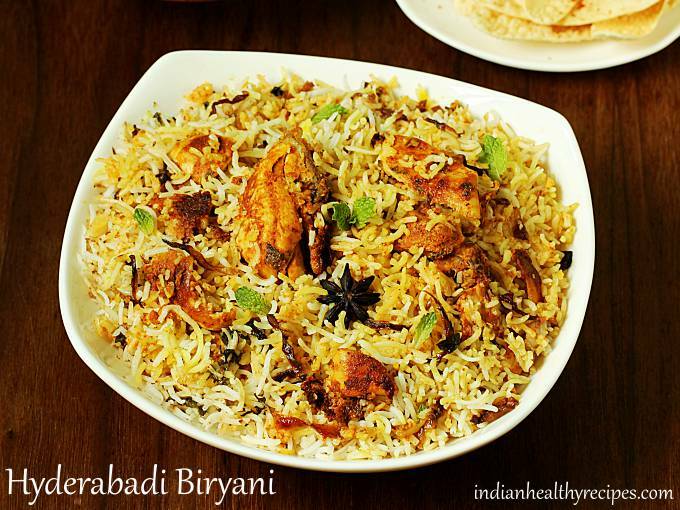 Hope you will like this hyderabadi biryani as much as we do. Awesome..another gem from your cook book…a big hit at my place.. Thank you so much. So happy to know your biryani turned out good. Really excellent recipe. I doubled the recipe, used Fage Greek Yogurt with no lemon juice because it was slightly sour and was more heavy-handed with the amount of salt. I layered chicken, rice, chicken rice. My coworkers were raving about it. So fragrant! Thank you so much. So glad to know your biryani turned out great. Thanks again for the comment. Hi, Swasthi. Your recipe is very easy to follow and it turned out really good. We, me nd my husband loved it. 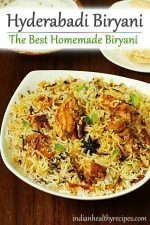 Whenever we want to prepare biryani at home we always see this recipe. Thank you for this great recipe. You are welcome. Thank you so much for the comment. Very glad to know your biryani turned out good. Sir, I like your recipes. I tried hyderabadi chicken biryani and gobi manchuriyan. Both were tastes simply supeb. Thank you very much sir. Thanks for trying. Glad to know the recipes turned out good. Made this for my Hyderabadi husband and he ate 4 servings! 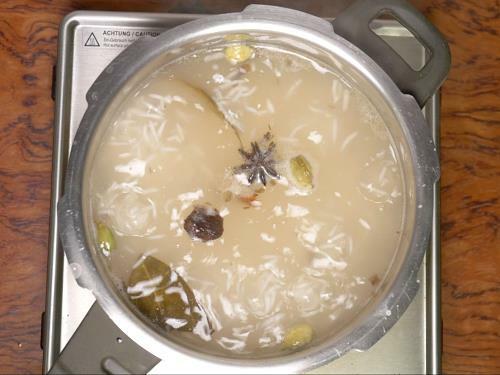 Thank you kindly for sharing, the video was especially helpful for seeing how to layer chicken and rice with all of the spices, onions and saffron milk. Thank you madam &internet. It will be useful for me to prepare the Hyderabadi chiken Biriyani. I shared your recepe & will try to prepare.Again thank you very very much. Hello, it was a great and easy to follow recipe. I am ended up pretty close to the pictures shown. 1. 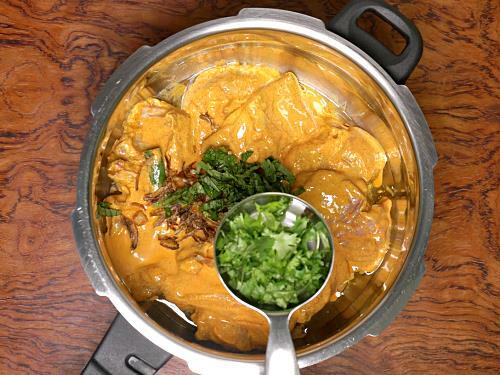 When layering chicken, please advise to divide the onions and coriander leaves into 3 parts. I put everything in and then realized that it was to be used 3 times. 2. It didn’t turn out to be very spicy like the Hyderabadi Biryani I know but it was good for my kids. You are welcome. Sorry for not replying I was on a vacation. Yes i will update the recipe with your tips. Regarding spicy – Hope you mean the heat from chilies was not enough. Most of my recipes do not turn out hot as I have kids at home. But there is no compromise on the flavor due to the spices used. Thanks for trying. I enjoy biryanis and have made a few recipes, but have always found them to be a bit ho-hum, with no surprises. This one is exceptional. The addition of mint, star anise and mace (I used nutmeg) to the rice made a huge difference to the final flavour. I need to pull my finger out and get some saffron to add another dimension (it was still good). It was much lighter and sweeter than any other recipe I have ever made or biryanis I have had in restaurants or hawker stalls. Thanks for posting this, it is now my go-to biryani. You are welcome. Thank you so much for the comment. Glad to know you liked it. Hi Swathi, is there a better way than putting thava? Can we bake it in Owen? Yes you can bake it for 30 to 40 mins at 200 C. More instructions in the recipe card. Looking really forward to trying this , I just wanted to ask if I double or triple the recipe would I still later all the meat at the bottom or would I add one layer of meat then rice then meat then rice and so on . I’d be grateful for your response ! This recipe is for a single layer of meat. If you are going to double or triple just use wider pot or utensil so that you can spread all the chicken at the bottom in a single layer. If you want to cook multilayered biryani check this recipe – Chicken pakki biryani. You can make 2 to 3 layers with that recipe. Hope this helps.